My friend Tina tortured us recently when she posted a picture of a similar sandwich to her Facebook. I don’t know where she got it, but I haven’t stopped thinking about it since. It always amazes me when something so simple can be this flavorful and satisfying. This is the time to enjoy those summer tomatoes, especially delicate and flavorful heirloom varieties. 1. Preheat Panini press to medium-high. Toast walnut pieces on a plate in the microwave for 45 seconds. Set aside. 2. Cut bread to make two hoagie type sandwiches. Take some of the stuffing out of the center of each slice. Just enough so you have a tunnel to place ingredients. 3. Spray the outside of bread with cooking spray. Spread 2-ounces of goat cheese on each sandwich. Divide and layer on the rest of the ingredients. Drizzle lightly with olive oil and sandwich bread together. 4. Grill until cheese is warmed through and bread is toasted. Calories 603. Fiber 5g. Fat 36g. Carbohydrates 50. Sodium 733mg. Protein 23g. Chol 26mg. Recipe inspired by friend Tina. Photo and recipe from Laura Flowers. 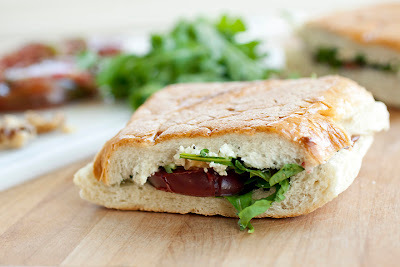 I LOVE goat cheese...these like pure perfection! YUM! And now...you're sharing the torture with all of us! Only seems fair. This will be so good with the tomatoes I bought from a farmer's market a few days ago. Thanks! Panini sandwiches are so good! This one proves my point:) Toasting the walnuts is the only way to go! This is going on my panini list! Love goat cheese. I won't be able to stop thinking about it now! Have a great long weekend. Simple perfection. Great recipe Laura! That is a gorgeous panini. All of these ingredients are things I love. =) Delicious! If you have a moment check out my blog. Tina always comes up with the best doesn't she? I love the art she creates with simple fresh ingredients :) Looks so pretty! i love anything with arugula. i've been experimenting with Paninis this summer. This looks like something we would LOVE. ...and I agree, the best things are simple!